The film features then Sheena TV star Irish McCalla as one of four shipwreck survivors who wind up on an island inhabited by a crazed Nazi surgeon, his disfigured wife, and some loyal S.S. leftovers. McCalla and company get caught in the fallout from the mad medico's monstrous experiments on the island's native girls in a loony endeavor to restore the beauty of his deformed wife by injecting her with the girls' DNA. An unfortunate side effect of the experiment is the transformation of the girls into hideous flesh-eating monstrosities. The film opens with an excellent medium shot of McCalla's pouty, spoiled Jerry Turner on the beach after the shipwreck, brushing her gorgeous blonde tresses. McCalla's experience as a pinup girl, along with Meredith Nicholson's camerawork, infuses this shot with enough fifties cheesecake to stock a New York deli. 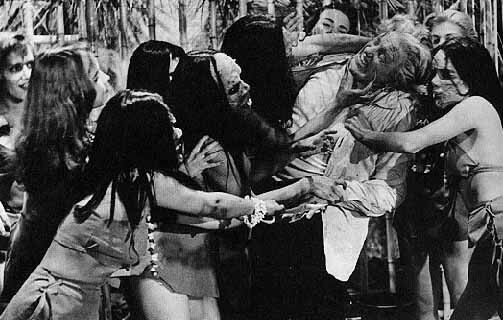 Cunha pumps the testosterone level even higher as the stranded survivors encounter the island's native girls, played by the Diane Nellis Dancers. Cunha captures these voluptuous "B" girls writhing in a surreal, bizarre native dance that makes Moreau's Lota look positively sedate by comparison. It's equally jarring when we finally meet the mad Dr. Karl Osler (Rudolph Anders) surrounded by his S.S. henchmen, still dressed in Gestapo uniforms. Cunha's affinity for smooth, over-the-top villainy makes Anders' performance the highlight of the film. 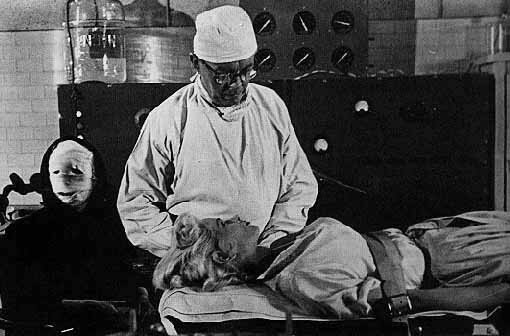 In our first glimpse at Anders' Osler, the madman is seen in close-up, squirting liquid out of a very large hypodermic needle (reminiscent of Boris Karloff's introductory close-up in 1932's The Mask of Fu Manchu). With this shot, Cunha and cameraman Nicholson clearly establish Anders' supreme villainy, and Anders exudes unctuous style as he glides through the film immaculately dressed, his cigarette encased in a stylish holder, coolly conversing about his litany of "unethical" experiments. Anders' Nazi sawbones is obviously a sinister stereotype---the kind of "movie Nazi" later lampooned in Hogan's Heroes. With a twinkle in his eye, he keeps his performance consistently enjoyable. Note the scene in which he attempts to seduce a dolled-up McCalla with a glass of his finest vintage wine. Anders fixes McCalla with a fangy leer that is almost vampiric. It's Anders' campy, dastardly style that gives She Demons its nasty edge. Anders' kitschy villainy unquestionably steals the show in She Demons. But his accomplishment isn't remarkable in view of his co-stars' lame performances. McCalla looks great as the spoiled Jerry Turner, but her acting is awful. In the scene in which Anders tries to seduce her, McCalla impassively glares at him with all the emotion of a deer staring at a pair of oncoming headlights and declares: "If you wish to please me, drop dead!" When she learns that Osler's island is an Air Force bombsite, she stiffly and dumbly asks, "You mean they're going to bomb us?" as if she is phoning in the dialogue from her patio. The casting of Tod Griffin as leading man Fred Maklin is also puzzling. Unlike Ed Kemmer in Giant from the Unknown, Griffin is neither handsome nor particularly heroic. In fact, when Anders' Osler imprisons him in a cage, Griffin looks puppy-dog pathetic. In a confrontation with Anders, Griffin lamely declares to the psycho sawbones: "I'll kill you if it's the last thing I do." And Griffin shares McCalla's weak, emotionally barren acting style. Neither of them possesses the credibility that graced Kemmer's and Ankrum's work in Giant. Cunha and H.E. Barrie share script credit for She Demons---and their screenplay best conveys the films smarmy, kitschy sensibility. In one scene, Anders' chief S.S. henchman (Gene Roth) asks McCalla how she got to the island. Her reply: "I swooshed in on a dry martini!" A puzzled Roth asks: "Vas iss diss svooshing in on a dry martini?" Anders' dialogue echoes dozens of previous "B" Nazi villains: "I haff zomesing verry zpecial planned for her," or "I'm qvite capable of performing more perzuazive measures...." The Cunha-Barrie script also gives us two unintentionally hilarious moments. In one especially surreal scene, Griffin and first mate Victor Sen Yung (frequent player of Charlie Chan's Number One Son) are being whipped by Anders' Gestapo goons. Amidst the torture, Griffin turns to Sen-Yung and mutters: "They don't fool around, do they?" Later, after meeting Osler's disfigured wife, Sen Yung asks Griffin if the two of them may be victimized by Osler's wife-restoration project. Griffin's deadpan reply: "Who'd want a wife with our face?" The Cunha-Barrie script is, at times, lame and laughable. Yet, as in Ed Wood's opuses, the script augments the movie's enjoyably sleazy style. Significant contributions are also made by Nicholas Carras' dramatic, tense music score and Meredith Nicholson's cinematography. Nicholson is especially adept at using close-ups and subjective camera angles to augment the film's action and fight scenes. And in the film's one shock segment---the unmasking of Osler's disfigured wife (played in that particular shot by Cunha's then-wife Kathryn)---Nicholson's camera gives us a lengthy close-up of a portion of the woman's desiccated, skull-like deformity (why Cunha couldn't give us a full face shot is a mystery). In addition, Carlie Taylor's deformed "She Demons" makeup looks cheap and exaggerated, but it captures the film's low-budget sense of putridity and decay. Interestingly, She Demons, like Giant from the Unknown, tips its hat to the classics, despite Cunha's refusal to affirm the influence of the horror genre. The film's nod to Island of Lost Souls is obvious. Anders' leering, languorous Osler is a poor man's Moreau, and his "She Demons" are distaff variations of the "manimals." 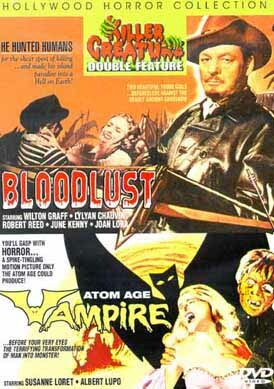 In addition, Anders' desire to restore his disfigured wife is clearly reminiscent of Bela Lugosi's motives in both The Corpse Vanishes (1942) and Voodoo Man (1944). And Anders' imprisonment of his mutated "She Demons" hearkens to the more recent plot lines of The Black Sleep (1956) and The Unearthly (1957). Further, it's difficult to deny the influence that She Demons must have exerted on The Flesh Eaters (1964)---another film about shipwreck survivors who encounter a Germanic mad doctor on a remote island. And She Demons' bleak mood and grimy degeneracy are echoed in such later films as The Brain That Wouldn't Die (1960), Bloodlust (a 1961 remake of The Most Dangerous Game that was photographed by Cunha), and countless Mexican horror films of the 1960s. In addition, Cunha's sense of sleaze and decay were certainly shared by such later genre auteurs as Herschell Gordon Lewis, George A. Romero, Stuart Gordon, and Sam Raimi. She Demons, like all Cunha films, continues to be savaged by critics. An especially acerbic critique is contained in Bill Warren's excellent but somewhat stuffy KEEP WATCHING THE SKIES (McFarland & Company: 1986). Warren labels the film "unwatchable" and refuses to acknowledge its bargain basement sense of fun. But in SLEAZE CREATURES (Fantasma Books: 1995), D. Earl Worth calls the film "an evil pearl of putrescence." Cunha himself took She Demons lightly and told Tom Weaver that much of the film's humor was indeed intentional. Whether the film's humor was intentional or not, She Demons is one of Cunha's most curious delights. Unlike Giant from the Unknown , She Demons possesses a sleazy, ugly underbelly, augmented by Anders' performance, Nicholson's stark photography, Carras' edgy score, and Taylor's overwrought, dissolute makeup. It's a film that almost feels dirty---and its nasty edge sets it apart from anything Cunha's low-budget peers were doing in the 1950s. Cunha's bow to Science Fiction---Missile to the Moon---was made with the stock company he formed during She Demons. H.E. Barrie co-wrote the script, Meredith Nicholson operated the camera, and Nicholas Carras' score was prominent as always. 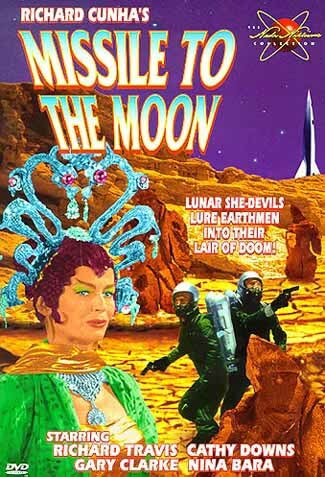 The film is a remake of 1954's godawful Cat-Women of the Moon, about a group of space travelers who find beautiful women and outsized monsters when they land on the moon. Cunha's version actually improves on the original---it's imbued with the tacky charm of many low-budget genre films. But for once, the critics were right: Missile is easily Cunha's worst film, mostly because it's dull---an adjective that doesn't apply to the rest of Cunha's canon. Our first view of the titular "Missile" reveals it to be cheap and toylike. Yet leading man Richard Travis takes one look at the retrograde rocket and proclaims: "You have to admit, it's quite an accomplishment!" The Cunha-Barrie script is loaded with that sort of delirious dialogue. As a stowaway on the rocket, Tommy Cook latches on to one of the moon maidens and instructs her: "Don't think, honey, just be beautiful!" And when a femme fatale tries to hypnotize Richard Travis, our hero whines: "Stop saying that. You're making me dizzy!" And this trip to the moon might as well be on gossamer wings: it's planned just seconds before the actual lift-off! The laughs generated by Cunha and Barrie don't compensate for the dull, endless talk generated by the script, both before and after our explorers reach the moon. One of the minor joys of Missile is reveling in the film's hilariously low-rent effects. The spaceship's control panel consists of a cabinet decorated with flashing lights, with controls marked "gyro" and "astro." On the moon's surface, our astronauts are attacked by a group of rock monsters---stunt extras, who look like they are dressed in giant Gumby outfits. 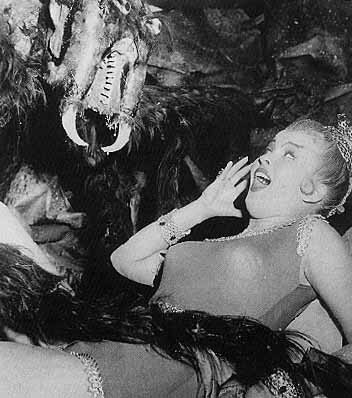 But the film's most endearing prop is the giant spider that the moon maidens unleash on the hapless heroes. The thing is more cuddly than creepy, with its mismatched eyes and lopsided fangs. In the Weaver interview, Cunha relates how the spider was found deteriorating in Universal's prop shop and was literally pieced together by his crew. And former 1940s pinup K.T. Stevens (daughter of directing great Sam Wood and, at the time, wife of Hugh Marlowe) as Lido, the lunar ladies' leader, wears an outlandish, fanned-out headdress, besotted with cheap trinkets and looking like a size 8 chandelier. Unfortunately, the film's uniformly poor acting undermines the memorably mangled effects. Leading man Richard Travis, like She Demons' Tod Griffin, is both unattractive and lamentably unheroic. When the space travelers finally reach the moon, he blandly utters: "This is the end of the line. Everybody out!" And near the film's conclusion, Travis is hypnotized into joining ranks with the moon maidens and dons a ridiculous, Asian-style robe that makes him look like a pudgy guest in a Geisha house. It's hard to imagine what Cunha was thinking when he cast Travis and Griffin as romantic leading men. The supporting cast contains such familiar "B" stalwarts as Gary Clarke (1958's How to Make a Monster) and Laurie Mitchell (1958's Queen of Outer Space), but they're as inept as Travis. (Clarke's intense G-force grimace during take-off is a sight to behold.) And Cathy Downs, as Travis' fiancée, is as vacuous and unemotive as Sally Fraser and Irish McCalla. Cunha simply seemed to be plagued with untalented leading ladies. What the film desperately needs is the credibility of an Ed Kemmer or Morris Ankrum, and the nasty verve of a Rudolph Anders. Two of Missile's bigger disappointments are the unexciting work of the generally reliable Meredith Nicholson and Nicholas Carras. Indeed, Nicholson's work is mostly absent, with much of the film consisting of stock footage. When Nicholson's cinematography is evident, it's so dull we wonder if his camera was immobilized during filming. Carras' musical score, usually dependable and dramatic, is routine and uninteresting here. And Cunha's penchant for outlandish, monstrous makeup is nowhere to be found in Missile. But we do get the skeleton-in-the-spacesuit shock scene! In KEEP WATCHING THE SKIES, Bill Warren described Missile as "...one of the most woebegone, uncaring Science Fiction movies of all time." The self-serious Warren is too hard on Cunha and the film, but he's not far wrong. Missile to the Moon has an enjoyably inept script and some loony effects. And it's far more enjoyable than similarly themed films, such as Abbott and Costello Go to Mars (1953), Fire Maidens of Outer Space (1956), and Queen of Outer Space (1958). But the film has none of the gritty edginess that distinguished Cunha's prior films---or his magnum opus Frankenstein's Daughter---which was co-featured with Missile for a delightful double dose of depravity.